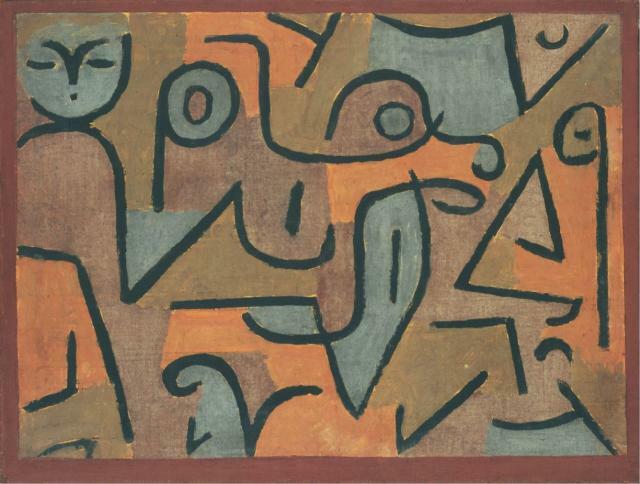 Young Moe is one of the few abstract portraits in Paul Klee’s oeuvre. Its title alludes to Albert Moeschinger (known as “Moe”), a professor of music theory with whom Klee had studied at the conservatory of Bern. In 1935, Moeschinger dedicated three compositions for violin and piano (Humoresken) to Klee, who gave him two paintings in return. Following his late style, Klee applied heavy black lines onto flat fields of color, filling his surface in all directions. The subtly modulating colors—from yellow to ocher, brown-yellow, and purplish-gray—have the emotional impact of a melody that supports the rhythmic linear notations above. One of the last Klee works acquired by Duncan Phillips, Young Moe was regularly displayed in the “Klee room” at the Phillips, inspiring artists such as Kenneth Noland and Gene Davis. This work is on view in Ten Americans: After Paul Klee through May 6, 2018. This entry was posted in Exhibitions, Experiment Station and tagged 10 americans, albert Moeschinger, Klee, Paul Klee, special exhibitions, Ten Americans. Bookmark the permalink.